You can mix yellow and black mustard seeds in equal proportion. If you want, you can use only yellow mustard seeds or black mustard seeds for the paste also or use 20g ready made mustard powder (cookme/sunrise) available in the market. Make a coarse paste of coconut and green chillies by using a food processor, add 2 tbsp of water while making this paste. Keep aside. 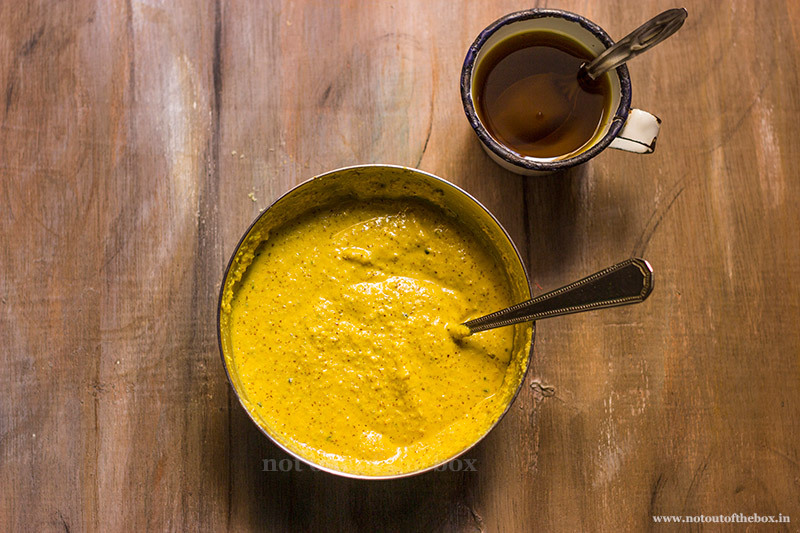 In a bowl, add coconut paste, mustard paste, turmeric powder, kalojire/nigella seeds, salt and Mustard oil. Mix well, adjust the consistency of this paste by adding some water into it. I added 2 tbsp of water, this mustard-coconut paste should be medium thick, not watery, so add water carefully. Keep aside. Boil some water in a saucepan, and deep each pumpkin leaves into it. Just dip for a few seconds and keep aside. You can do this with the help of a tong. 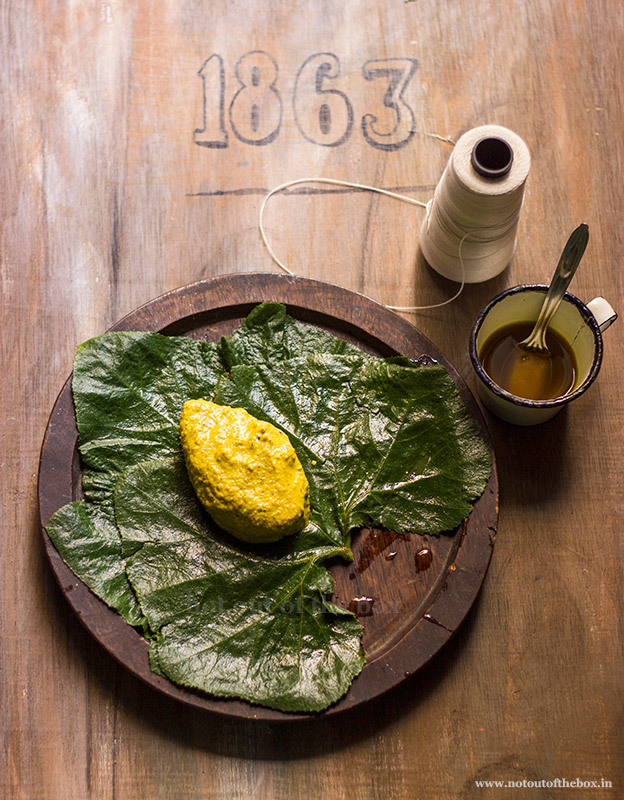 Grease the darker side of the pumpkin leaves with mustard oil, you can use a pastry brush for this. Now to make the fish parcels dip hilsa pieces into the mustard-coconut paste, one at a time. 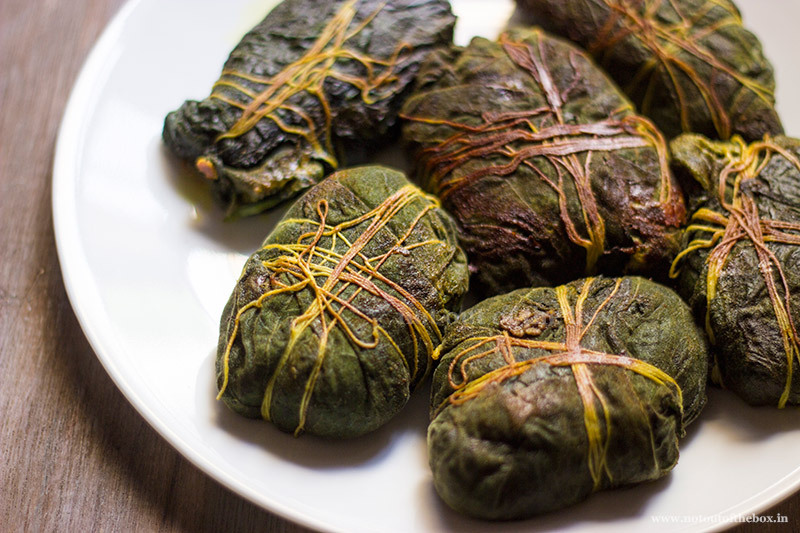 Take 2 pumpkin leaves, keep the greased sides up, place the coated piece of Hilsa in the middle and fold the leaves from every side towards the centre. You can add slitted green chilli with this (optional). Tie with cotton thread. Continue the same process for every piece of fish. Grease a nonstick frying pan with mustard oil. Place the fish parcels/paturi on the frying pan. Cook for 20 minutes on low flame. Flip the parcels gently in between and add some mustard oil in the pan (add the oil from the sides of the parcels) after first 10 minutes of cooking. 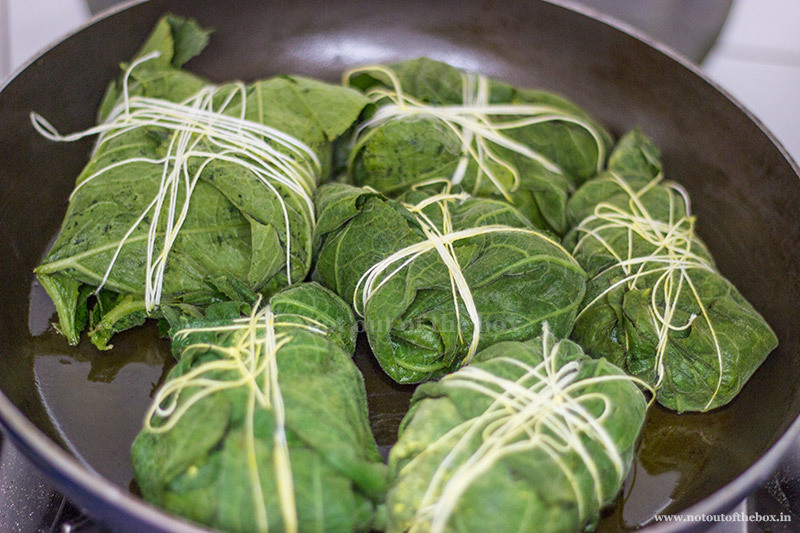 Let the parcels turn dark green in colour so that the leaves can cook thoroughly. Remove from heat. 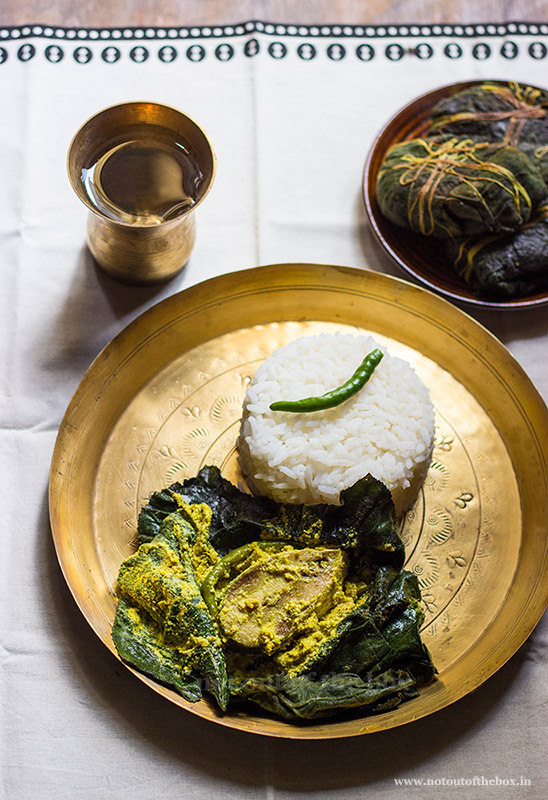 Your delicious Kumro patai Ilish is ready to devour. Discard the cotton threads before serving. Serve hot with steamed rice. 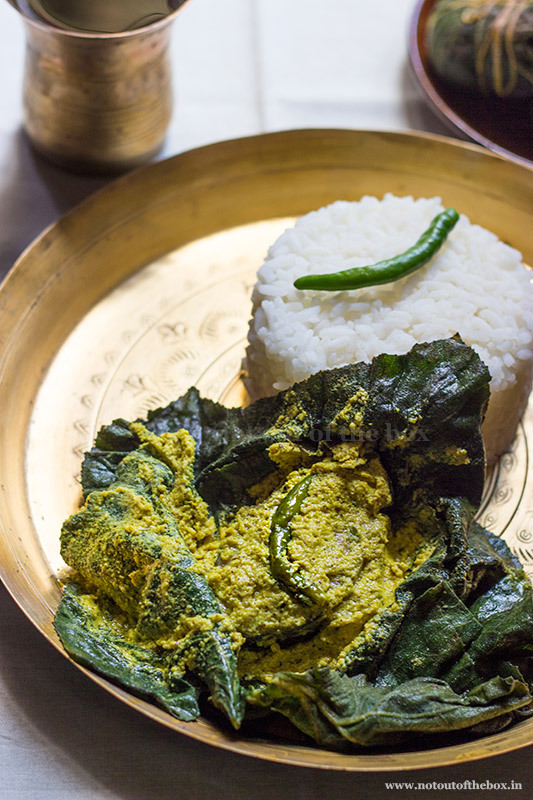 Enjoy the Hilsa and soft mustard slathered pumpkin leaves both with rice! 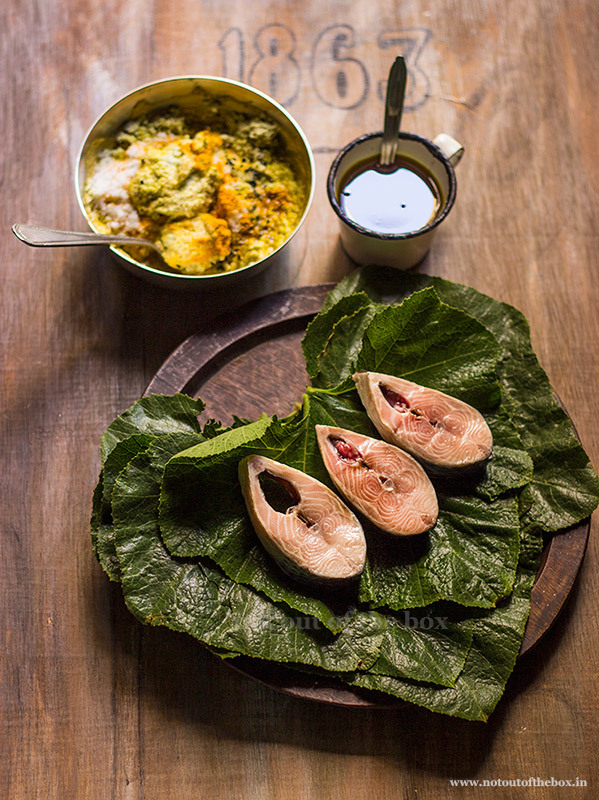 The same recipe can be cooked with bottle gourd leaves (lau pata). Looks good – is there an alternative to pumpkin/gourd leaves? Those aren’t available where I am. Perhaps collard greens or kale? Thank you. I’m not sure about making this with kale. You can try with collard greens, I’d suggest to make it in a small portion first for tasting.